A must-buy for all those who eat, drink and love to be merry. Delicious looking designs are a feast for the eyes which are always on a lookout for grubs. 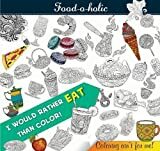 The food-a-holic would color away to fill his appetite, making weight gain a myth. In no time, color steals into his heart till he finds himself steeped in the flavors of his imagination.